84193 • Tamiya McLaren MP4/6 Honda • F104W • (Radio Controlled Model Archive) • RCScrapyard. Released by Tamiya on March 26, 2011, the McLaren MP4/6 Honda kit (#84193) is No.693 in the Limited Sale Series, based on the F104W Chassis. 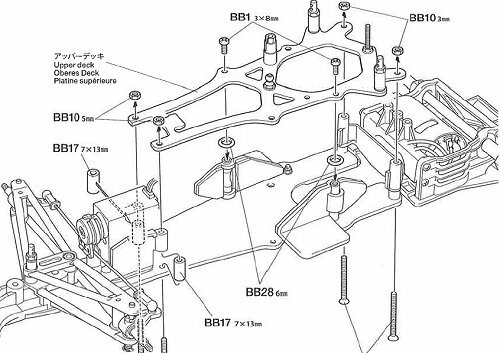 The original Tamiya McLaren MP4/6 Honda kit (#58104) was introduced in March 1992, based on the F102 Chassis. The model is of the McLaren MP4/6 Honda that was driven to victory by Aryton Senna in the 1991 season of the F1 World Championships. 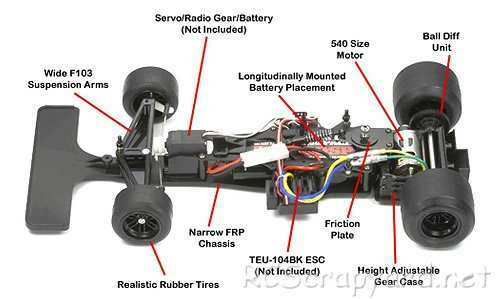 A lexan bodyshell and 540 motor are included, but a radio system, battery, charger and speed controller are required to complete. Based on the F104 Chassis, the F104W (W for Wide) has the same double deck design features as the F104 but with the front wishbones of the F103 Chassis. The basic F104 is 180mm wide and the F104W is 205mm wide, making it 25mm wider. This is achieved on the rear by simply placing the hub mount deeper inside the rear wheels and on the front by utilising the F103 configuration. Ball bearings were included for rear axle, with bushings for the front. The different sizes are used basically for strength. 32dp gear teeth are larger than 64dp gear teeth, therefore the 32dp gears are by design stronger and for this reason are more commonly used on a number of entry level buggys, to help them withstand the knocks and crashes by drivers new to RC and nitro models because of the higher torque levels involved. Also, the bigger the scale of the model, the stronger the teeth need to be.